There are very few repeat state champions in high school golf. Tyler Witman watches his tee shot as he starts play on the back nine during the final round of the 2003 Delaware state high school golf championship. Therefore, Tyler Witman is in very special company. The Cape Henlopen High School senior won his second statewide championship on May 30, with a fine 73-76-149 total score over the tough Wilmington Country Club South Course. He beat Dave Simmons of Concord High School by a single stroke. Going into the second day’s round, Witman held a one-shot lead on Simmons. The Concord player managed to outplay Witman on the front nine, however, and the two players were even as they started the back nine. Lightning caused a one-hour delay in the action, but Witman said he wasn’t affected by it. On the other hand, the South Course eventually took its toll on most of the tournament players, and Witman and Simmons were no exceptions. Coach Jerry Dorneman, Assistant Coach Corey Groll and I watched the two competitors play the last four holes with Dover’s Will Scarborough, who by then was out of the running for medalist honors. Witman had the lead at that point, but then made it interesting. Witman’s next shot reached the green, but barely, while Simmons’ chip rolled 10 feet past the hole. Witman’s double-bogey and Simmons’ bogey tied both players. On the next hole, Simmons and Witman both hit drives into the right rough, and neither one could reach the green with their approaches. The resulting bogeys kept the two boys tied as they reached the final hole. Simmons hit a fine drive down the left center of the fairway. Witman hit an even better drive several yards past Simmons, on the right center. Simmons’ second shot was “a little fat,” according to Witman, and came up far short of the green. Witman’s approach landed about 25 feet below the pin, and then rolled back another 5 feet or so. Simmons’ chip shot also came up short, nearly parallel to Witman’s ball on the green. The Concord player’s first putt then stopped about 3 feet away. Witman’s first putt was on a nice line, but then curled left and stopped about a yard from the hole. Simmons made his bogey, and after a careful look at the green Witman rolled in his par for the win. Witman came in fourth in the states as a freshman, and won the event as a sophomore. 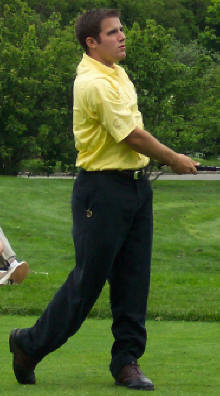 He lost by a single stroke as a junior, and played well enough to win again as a senior, after a very good season. 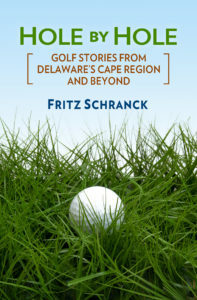 The Henlopen Conference Championships on May 22 at Sussex Pines may have helped Witman in the states. He lost to Scarborough in a playoff, after both players shot 2-under par in wet conditions. The Vikings’ fifth-place state tournament finish this year, thanks to Witman, Brad Schneider (82-85), John Purple (90-91), and Micah Vugrinec (88-100), should give the returning players a good target for next year. Juniors Brett Hertel and Andy Lee are coming back to the Viking squad, joined by sophomore varsity veterans Purple and Brian Davidson and freshman Jason Hastings. Witman will attend the University of Maryland on a golf scholarship, and Vugrinec will go to Methodist College for that school’s well-regarded golf program. Schneider plans to study turf management at Delaware Technical & Community College. This was one of the better Cape golf teams, and this is a school with a very good golf tradition.